Where does the time go? It’s a trite expression, but a true one. Especially when your home turns into a summer cottage for friends and family. Over the last little while we’ve been entertaining guests and baby sitting grandchildren to the point where this blogg has been ignored for want of time and inclination. Nonetheless, it has been an interesting summer so far. Some would say the tourist crowds are off this year and blame the price of gas. Judging from the traffic on High Street, I wonder. The beach is busy on weekends and gloriously clear of summer people during the week. 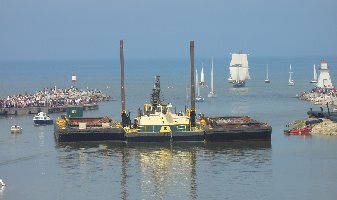 Although the barge out off Chantry Island is an ugly sight. They’re laying a new water intake on the lake bottom. Sitting on the sand watching, I’m amazed to see a big crane just off shore. It scoops out rocks, sand and water and dumps it all into a giant truck that drives in and out of the lake. Not what you expect to see on lovely Lake Huron. Southampton’s 150th Anniversary Celebrations kicked off last weekend to a ‘standing room only’ crowd to see “Captain and the Council” a play celebrating the incorporation of Southampton as a village. 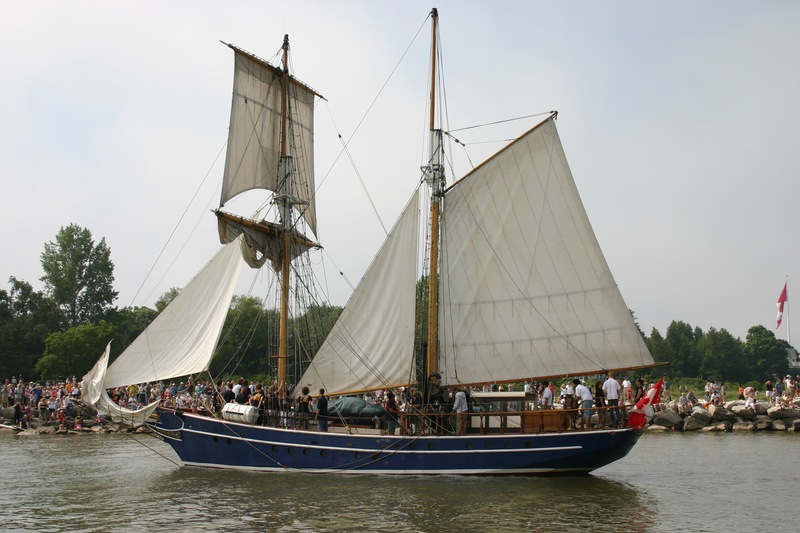 A Tall Ship, That’s right – only one visited our harbour. There were supposed to be two but the other experienced engine trouble and headed backed to Toronto. Judging from the crowds lining the docks on both sides of the river, thought, no one was disappointed. It was a foggy morning to begin with, but around 11:00 AM sunshine prevailed, blue skies appeared and The Playfair sailed into the oldest port on the Bruce Coast. Quite a sight. 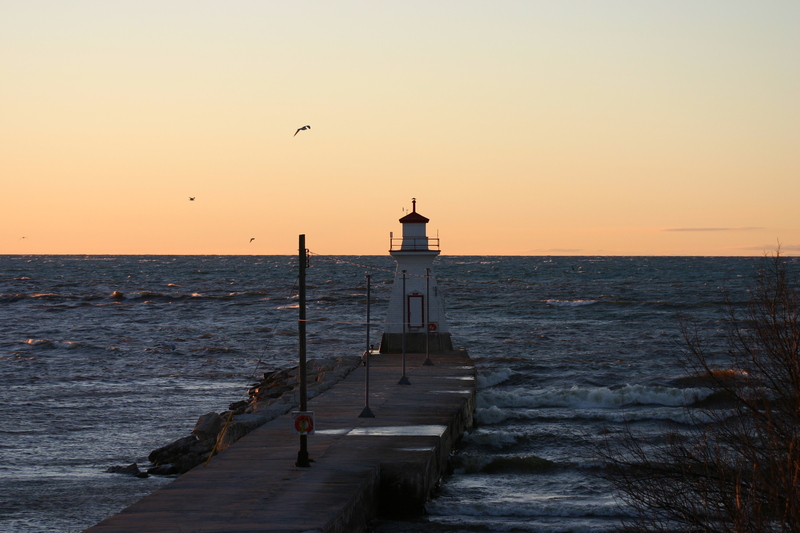 Next morning when it was outward bound for Owen Sound hardly anyone was there to wave goodbye. We watched from the Range Light Pier. There’s a derelict beach that runs out from there. The town never cleans it because there are too many rocks. Not good for swimming or sunbathing. It’s a wild stretch. Trees driven in by winter winds collect on the shore. Bent and twisted driftwood piles up. People like to come and take the best pieces to landscape their property. 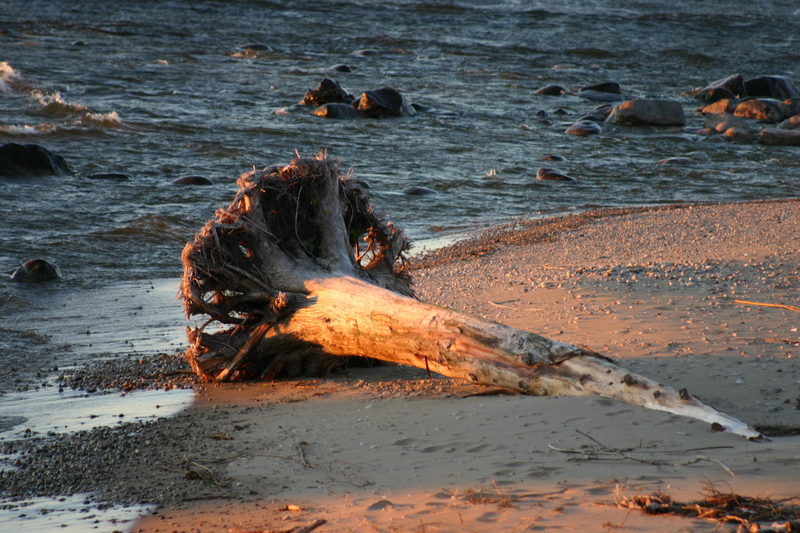 That morning, I watched an elderly gentleman drag a giant gnarled tree stump up from the beach. He struggled a bit. I offered to help not sure if what he was doing was against the law. Beach theft. He declined my offer. Ultimately a friend appeared and they dragged the driftwood up the rocky hillside, stuffed it into the back of their van and drove off. By now the Playfair was well out of the harbour and the driftwood absconders well gone. These are the strange and unexpected things that are happening this summer. And the summer isn’t over yet. More company is coming. The 150th Anniversary gets into high gear mid-August. And I’m wondering when winter will be here. With all the rain we’ve had, the grass is very happy…and tall. Summer heat waves haven’t yet struck to drive it brown, straw-like and dormant. Homeowners have little choice but to cut. The lawn care fanatics do it twice a week. And mostly after 6:00 PM. The unrelenting drone of engines fill the evening air. It reminds me of the Vespas that streaked through every Italian city and town I’ve been in. It sounds like the incessant buzzing of wasps. Some people in Southampton have chosen to cut their grass or weeds or both, depending on what level of lawn care – or lack of it – they indulge in, well into the evening. Gas movers, walk-behinds, riding mowers, small but expensive John Deere tractors with full cab for sun protection are being pushed, pulled, followed, driven and rode over lawns and fields with great purpose. Every lawn has that tidy, fresh-clipped, golf course perfect look. Along with the aroma of fresh cut grass, the air is heavy with the smell of exhaust…the perfume of a summer’s evening. Given the price of gas these days you have to wonder if its rise will ever reduce the amount of grass cutting home owners indulge in. Or will there be a wholesale switch to electric, battery or solar powered contraptions? Sure doesn’t look like it. So, we burn a renewable resource and pollute the air all in the pursuit of a picture perfect lawn. Good thing we live in the country. There’s lots of fresh air to go around.